When I met my husband’s family many years ago, I learned very quickly that they were a card playing family. Euchre was & is their game of choice. 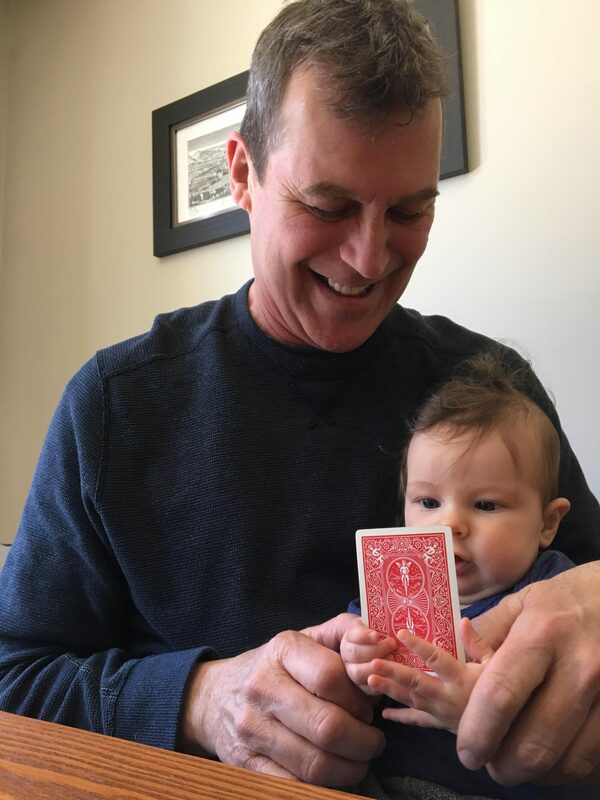 Rather stunned to hear I didn’t know how to play, his grandfather half jokingly, but rather sternly pointed out that if I was going to be part of the family, I had better learn how to play euchre. As a shy, non card playing 20-year-old, it was rather intimidating to sit & learn the game with this group. They were & still are a family who are very vocal in their card playing shenanigans. It comes as no surprise then, that our children were taught from a very young age. Playing euchre in this family is just a given. At pretty much every family function over the years, the cards come out, sometimes spanning 4 generations at the table. LAM’s Daddy at the table with his Great Grandma, his Grandpa, his Auntie & his Dad. And so it seems only natural our wee LAM is next in line to learn. As I sat watching her in her Grandpa’s lap, cards in hand, I couldn’t help but think of the number of times she too, will find herself around the table with family, discovering the game her Great, Great Grandfather taught me how to play all those years ago. I am sure he would be absolutely chuffed to bits to know that despite his absence, his legacy lives on as we continue to share the tradition he so loved with his family. Holy Crap Grandpa, “I think we’ve got Hearts Alone”! This entry was posted in Stories from the G-Ma Crib, Uncategorized and tagged Ageing, Family, Grandparents, Life Lessons, Relationships. Bookmark the permalink. Absolutely love your recent post Lynn! Lucy looks like she could get quite excited about the game. I was just thinking that I will have to learn. Our family card game is cribbage. Many New Brunswick winter evenings in my youth were spent around a crib board. We can teach you Carolyn! Our family also loved to play crib, you & I will have to play next time we have a get together! When I met my Lynn’s family, I found out they were into playing all kinds of board games at all family gatherings. I hate board games. While dating, I would begrudgingly play. Now that we’ve been married (next month will be) 5 years, I no longer play. Emilio, I don’t think you are alone in feeling that way. i think many people are either games people or they are not! 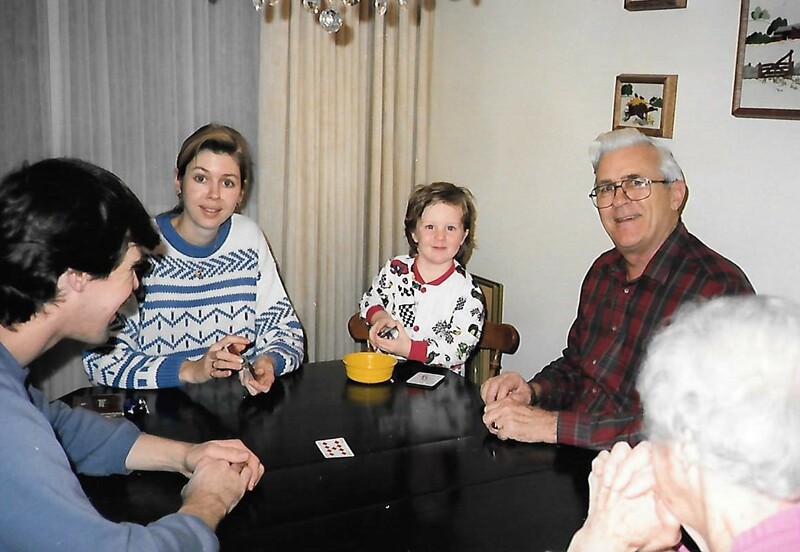 I developed a love of card games at an early age with my parents – we played canasta and pinochle. My husband was raised playing cards as well – some German games that he taught to me and to our daughter. It’s a wonderful way to spend time with family and friends. We never played Euchre but I’m sure it is a fun game. How wonderful to pass this tradition on to the next generations! Canasta is really easy – I’ve been playing bridge for about 6 years and still feel like I don’t know the game – but I love it. I have to admit I too have zero knowledge of this game, but we have always played tons of scrabble and tile rummy as a family. Very cute pics! And I do love the idea of continuing family traditions especially fun ones like this! I have friends who love to play scrabble on our girls weekend! I still think there is something special about sitting around a table as a family & playing games. Good old fashioned fun! I don’t know that game, but I love sitting around a table with family or a group of friends playing cards or a board game. What a lovely tradition! Me too! We have passed many hours over the years as a family, gathering around a table to play a game. Lots & lots of wonderful memories! My family was also a card playing family. Dad taught me how to count via Blackjack. We play many games tho. I think my fav is cribbage, but good ol gin rummy is also fun. I love cribbage too! I have never played gin rummy but I understand it is a great game. I regret, a little bit, that my husband feels that playing cards is a waste of time. I miss it. Oh yes, crazy 8’s! That sure brings back memories as a kid. That’s kind of sad that your husband doesn’t like to play, given your enthusiasm of the feeling of a lone hand. Perhaps you could source a card group to play with! There is a bridge club in town… but then I’d have to learn the game all over again. Not sure I can handle the pressure! Me too Lynn. Some seem to get passed down from generation to generation, others begin within our own little families. Proud Grandpa with one cute kid! Great picture. He sure is Nelson. Thanks for visiting! Hi Lynn. Could you please change my email address to roseannavachon@gmail.com. Thks. Roseanna, I don’t think I have the ability to do that as you have ownership of your own email. I might be able to delete your old address from my followers. If you don’t mind, can you re follow with your new email address & once I receive notification of that, I can try to delete your old one? I can relate to this post so much, because my in-laws also played Euchre! (As well as poker.) Personally, I found it a bit difficult to learn, mostly because I was so worried about making a mistake. But now my husband and I play regularly with some good friends, and of course the extended family plays together too. What a nice tradition to pass down! It can be a bit complicated until you have a good understanding of the game. I totally understand how you might have felt intimidated Ann. Thankfully, although my husband’s family had been playing for some time when I arrived on the scene, they were always patient with me when I was learning. They are a boisterous bunch when they play which is what I found most intimidating at first. Now I don’t even give it a second thought. Guess that comes with 34 years of marriage!